Balancing a ceiling fan usually involves sticking a small weight onto one or more of the fan blades. The weights are sold in inexpensive kits that include a plastic clip to help you determine where to place each weight. Most new fans include a balancing kit with their packaging, so you may already have one on hand. You can also balance a fan with ordinary household items. Whatever you use, don't balance your fan until you've cleaned and inspected the blades and have made sure the fan is securely mounted. Dirty blades and loose fan parts are common causes of a wobbly fan. 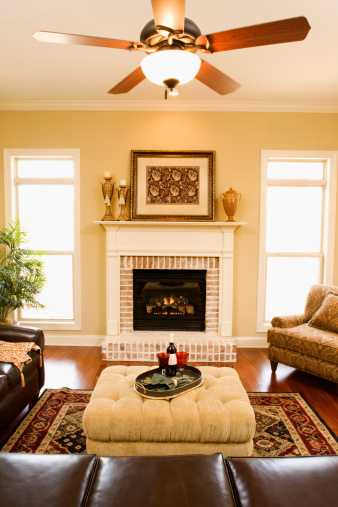 Ceiling fans are sensitive enough that buildup of dust and grime can throw them off balance. And even if your blades look clean from below, the view from above might not be so pretty. Wipe both sides of each fan blade with a dust cloth or a slightly dampened rag to remove all dust and oils. Inspect each blade to make sure it is flat—not warped—and is securely fastened to its bracket and to the motor unit of the fan. Blades are usually fastened with screws, but some have keyhole slots that fit onto the brackets. Brackets typically fasten to the motor with screws. If any blade is badly warped or can't be tightened to its bracket, replace the blade. Clean the blades on ceiling fans to keep them operating smoothly. Wobbly ceiling fans are often loose ceiling fans, and a loose fan can be dangerous. Most ceiling fans are mounted with a metal bracket that connects the motor unit to the electrical box in the ceiling. The bracket is fastened to the box with two or more machine bolts (these are not nuts; they're fine-thread screws with square, not pointed, tips). These bolts can loosen over time, allowing the bracket (and the fan) to shimmy a bit. The electrical box itself can also loosen, which is a much bigger problem. Non-contact voltage tester is used to test for power before making electrical repairs. To check the condition of the fan mounting, turn off the power to the fan's circuit by switching off the appropriate breaker in your home's breaker box. Loosen the screw(s) of the decorative cover or shroud at the ceiling (above the fan) and slide the cover down, away from the ceiling. This exposes the electrical box and the fan and circuit wires. Test all of the wires with a non-contact voltage tester to make sure the power is off. Use a screwdriver to tighten the bolts securing the mounting bracket to the electrical box. Then, grab the mounting bracket and try to move the box from side to side. If the box moves, it's either the wrong type of box (i.e., not designed for ceiling fans) or it's improperly mounted—or both. The fan installation is not safe, and you should re-install the fan with a ceiling-fan-rated box anchored to the ceiling joists (not the drywall). If all looks good, secure the decorative cover back into position and turn on the power to the fan circuit. Test the fan to see if it still wobbles; if so, it's time to balance the blades. This is an easy process but requires some trial and error to get it right. The trick is to test each blade, using the plastic clip from the kit, to find the one that's throwing off the balance. Once you've done that, you move the clip in and out on the problem blade to determine the ideal position for the balancing weight. Start by fitting the clip over the rear edge (the lower edge) of one of the blades. Turn the fan on high speed (this assumes it wobbles the most on high speed; if yours happens to wobble more on a lower speed, use that speed for testing). Watch the fan to see if the wobble is gone. If not, turn off the fan and move the clip to the next blade, and repeat as needed. When you've found the problem blade, try the clip in a few different positions on that blade, sliding it closer and farther from the fan motor and checking for wobble with each position. The position that stabilizes the fan the best is where you apply the balancing weight. Peel off the non-stick backing from one of the weights and stick the weight onto the top side of the blade, aligned with the clip and centered front to back on the blade. Test the fan a final time (hopefully). If you're still getting a little wobble, repeat the balancing process and add a weight to one or more of the other blades. If you don't have a balancing kit and don't want to buy one, you can follow the same balancing steps as with the kit but substitute a small binder clip for the plastic clip in the kit, and use a penny or metal washer for the weight. A 3/4-inch-wide binder clip weighs about 2 to 3 grams. A penny weighs 2.5 grams (pennies minted in 1981 or earlier weigh 3.1 grams). Weights in balancing kits usually weigh about 3 grams. If you glue a penny to the blade with a dab of hot glue, the total weight is close to 3 grams. Hot glue is best because it's removable. Another option is to use poster putty, or reusable adhesive putty, such as Blu-Tack or Fun-Tak. Form the putty into a small ball and simply stick it onto the top side of the blade. You can use the putty for both the balancing test and the permanent weight. What Causes a Lawn Mower to Shake?